Life in Pieces: Cancelled or Renewed for Season Three by CBS? Will the Short family’s story be cut short? Has the Life in Pieces TV show been cancelled or renewed for a third season on CBS? The television vulture is watching for the latest cancellation and renewal news, so this page is a dedicated place to track the status of Life in Pieces season three. Bookmark it, or subscribe for the latest updates. Remember, the television vulture is watching your shows. Are you? Airing on the CBS television network, Life in Pieces follows the Short family. Every episode of the comedy series is divided into four parts. Each quarter tells a short story about one generation of the family from its point of view, before bringing them together in the conclusion. John (James Brolin) and Joan Short (Dianne Wiest) head up the family. The cast also includes Colin Hanks, Betsy Brandt, Thomas Sadoski, Zoe Lister-Jones, Dan Bakkedahl, Angelique Cabral, Niall Cunningham, Holly Barrett, Giselle Eisenberg, and Hunter King. 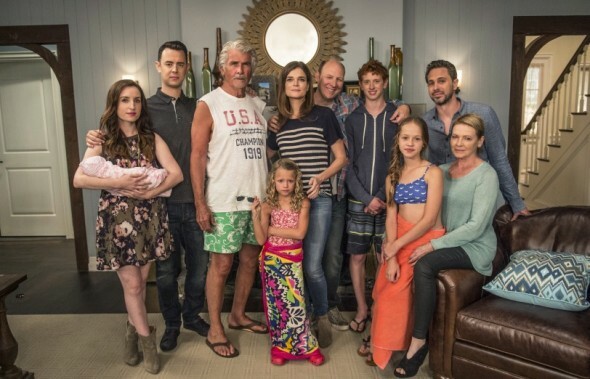 The second season of Life in Pieces averaged a 1.26 rating in the 18-49 demographic with 6.12 million viewers. Compared to season one, the sitcom is down by 37% in the demo and has dropped by 30% in terms of average total audience size. Find out how Life in Pieces stacks up against the other CBS TV shows. On March 23, 2017, Life in Pieces was renewed for a third season. It will debut on November 2, 2017 at 9:30pm EST. CBS holds their sitcoms to high standards when it comes to ratings and Life in Pieces has come way down this year. I suspect that the network will renew this ensemble comedy for a third season but it’s certainly not a sure thing. I’ll be watching with great interest. 3/23 update: Life in Pieces has been renewed for season three on CBS. Details here. I’ll look elsewhere for my supper. Check the rankings for all of CBS’ 2016-17 TV shows. Read about other Life in Pieces TV series news or other CBS TV show news. Check out our list of already cancelled and ending shows. What do you think? Are you happy CBS renewed its Life in Pieces TV show for a third season? How would you feel if CBS cancelled this comedy TV series, instead? Life In Pieces: Is the CBS TV Series Cancelled or Renewed for Season Five? Life In Pieces on CBS: Cancelled or Renewed for Season Four? Life in Pieces: Cancel or Renew for Season Two? we have to rewind 1+ times to catch every nuance…to miss even one would be a loss. If this one phrase , “Uncle Dad,” leads you to want more, this show is for you. We LOVE this show. Please keep it on the air! With all the junk out there, to cancel it would be a disservice to a demographic of people would rather laugh at something smart and cute than laugh uncomfortably at something vulgar! This show is one of the funniest sitcoms on TV today. My husband and I (especially me) laugh so hard, even out loud, through the whole show. The concept of the show with the 4 separate parts of the whole is very innovative, not just the usual “formula”. I have recommended this show to many people,especially when they need a good laugh to brighten their life. Please renew it , more people need to really let out a few good belly laughs and see something original for a change. This is one of the funniest shows on TV today! Please give it a fair chance! This show only get better and better every week! The actors are so perfect together, and that’s hard to find! Please, Please!! Don’t cancel this show!